These web sites contain USS Fox related information or provide a reciprocal link to our pages. To add a link, send us an email. Stunning video the country was not suppossed to see. Just watch this short video and think back over the years. This is incredibly great and moving. It humbles you down to your toes. It is one of the finest tributes you will ever see. The USS Pennsylvania is an Ohio Class Submarine and the largest Submarine in the world. This is a very interesting Navy film that you should enjoy. Here's a YouTube video of former Gunners Mate First Class Ernest Borgnine and the US Navy Band presenting "The American Sailor" - a wonderful interpretation of what it means to be a sailor. Pearl Harbor: This is what takes place after the tourists have gone for the day. Very moving. Does this look familiar? Do you miss this? A video commerating Veternas Day. Rick Monday of the Chicago Cubs. This should take most of us back, For all the youngsters, you missed a great era. Ceremony Commemorating the 40th Anniversary of the Normandy Invasion, D-Day 6/6/84. Let's hope that everyone who receives this appreciates what those who served in Vietnam sacrificed for our country. The link below is a virtual wall of all those lost during the Vietnam war with the names, bio's and other information on our lost heroes. Those who remember that time frame, or perhaps lost friends or family can look them up on this site. A story written by a reporter whose son joined the Marine Corps when others assumed he would go to a well known college. Find, locate and get in touch with old military buddies. Big database of information on reunions, organizations, associations. Huge resource for warships of the world, weapons, Naval reunions, technology, Naval history and fiction. Commencing with the launch of its US Marines website on the Marine Corps Birthday in 2003, Togetherwerserved.com has produced a series of US Military community heritage websites specially created to enable current or former serving US Servicemen and women to reconnect with old friends, create a lasting legacy of their service, and share in the camaraderie of others who served. Listing of personal rosters and ship information for many Navy ships. The National Association of Destroyer Veterans with over 24,000 members. A non-profit site that seeks to honor all who have served in the sea services and perpetuates their heritage, values and traditions. 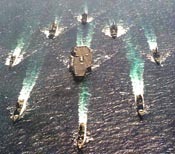 Has the largest collection of Navy images available on the internet. A personal web page maintained by a fellow in Germany. Lots of info about individual ships including photos and ship's patches. The USS Little Rock was a WWII light cruiser. She was converted to a guided missile cruiser and served extensively as flag ship of Commander, Sixth Fleet in the Mediterranean. The ship is berthed at the Naval Park in Buffalo, NY and is open to the public. Agent Orange affected many shipmates during the Vietnam conflict. If any unit in which you served ever deployed to the Tonkin Gulf during the war, check this list. During the better part of the 20th century, the United States Armed Forces used asbestos in the production of many types of ships , buildings and vehicles, thus exposing countless soldiers and workers to this terrible mineral. At its peak, asbestos was used predominantly in factories during World War II and many U.S. veterans suffered from mesothelioma as a result, because the harmful effects of asbestos were not known until decades later. Even now, as asbestos use and production has declined significantly, many veterans could still be afflicted, unaware of the early symptoms of mesothelioma cancer. Countless veterans are currently suffering from life-threatening illnesses that are a result of exposure to asbestos, a material that was commonly used in hundreds of military applications, products, and ships because of its resistance to fire. We have created a veterans-specific section on our website in order to help inform about the dangers of asbestos exposure. Information. Answers. Help. Every mesothelioma patient needs quality resources and support, and The Mesothelioma Center provides all of this through a number of free programs. These resources are yours for the taking. that will help further educate students of this rare cancer. Mesothelioma Hub is your ultimate source for the latest information about mesothelioma and other asbestos-related illnesses. Their mission is simple: to connect mesothelioma patients and their families with up-to-date educational, medical, and legal resources they need. Our main focus is to provide accurate and helpful information, support and resources to patients and their loved one. We want to help them better understand their diagnosis, how to find treatment, and all options available to them. Our team is here to help those affected by mesothelioma with compassion and care.